INDIANAPOLIS -- Dozens of church members gathered at Zion Tabernacle Apostolic Church on Indianapolis' east side Sunday to pray for Tia Coleman, a mother who lost her husband and three children in the Missouri duck boat incident. Coleman attended the church’s Sunday School from the time she was a baby and was a member of Zion Tabernacle Apostolic Church until she started a family of her own, according to Elder Samuel Rogers. Tia’s mother, Barbara Thomas, also attends the church and was not on the duck boat that sank. At the beginning of its 11:30 a.m. service Sunday, Pastor Thomas Griffith told the congregation to pray for Tia and her nephew Donovan, who also survived. In a news conference this weekend, Tia Coleman said her faith would get her through this tragedy. Coleman also said any supporters wishing to help her family can donate to the official Go Fund Me page. So far, people have donated $443,330 to Tia Coleman and her family for funeral and other expenses. "Eleven family members went on a family vacation when a horrible boating accident killed nine family members, including Tia’s husband Glenn, their three children Reece, Evan and Arya along with her Mother and Father in Love Belinda and Horace Coleman, her sister in love Angela and her son Max," read the Go Fund Me page. "Any donations will help in laying our nine loved ones to rest." Pastors with the Zion Tabernacle Apostolic Church told the congregation Sunday to help through that website. “Honor Tia’s wishes, and go that direction,” said Rogers. The church, located at 4007 North Sherman Drive, is getting calls from around the country asking how they can help Tia. “We really want to hold this family up in prayer,” Pastor Griffith told the congregation, who applauded in response. During the service, the church also recognized the names of the victims who died in the Missouri lake. 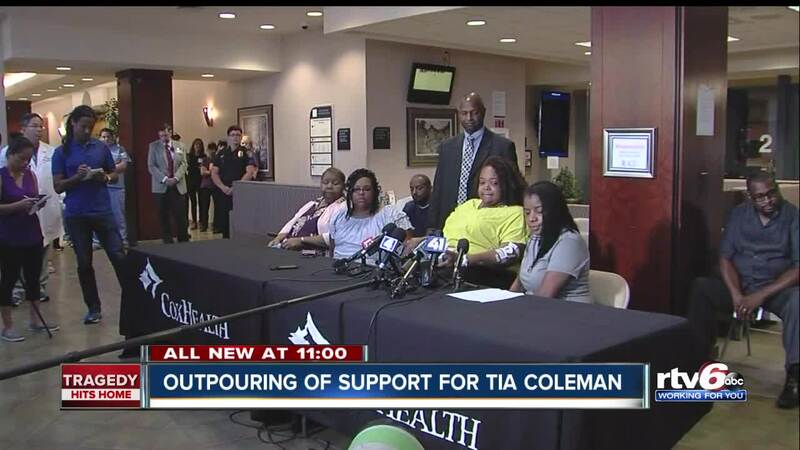 Tia Coleman plans to rely on faith, love, prayers, and support to start her recovery and church members say they’ll be there for all those things.